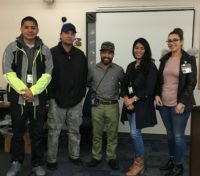 SACRAMENTO – California Statewide Law Enforcement Association (CSLEA) attorneys conducted new employee orientations with CHP dispatchers, a Cal OES emergency service coordinator and an Employment Development Department (EDD) investigator March 18-20th, 2019. “We welcome our six new members and existing member and thank them for spending time with our attorneys to learn more about how CSLEA can assist them,” said CSLEA President Alan Barcelona. CSLEA Senior Attorney Andrea Perez assisted with the orientation for CHP dispatchers at the CHP Academy in West Sacramento as did CHP-Public Safety Dispatchers Association Vice President Victor Tovar. Perez also visited Cal OES in Rancho Cordova. CSLEA Counsel Stacy Olsen visited EDD in Southern California.